Concept picture for thinking out of the box or venturing out of the norm. 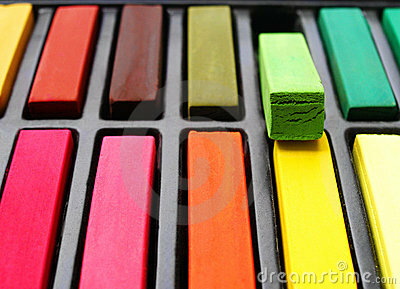 An image of a box of brand new high quality artists soft pastel sticks. With the bright green pastel half taken from box to provide a break in visual pattern. Art materials for drawing pictures etc. Colorful and bright. Slightly shallow depth of field for interest. Horizontal color format.